One of the important aspects should be considered in a project team is the leadership. For the new Garuda AACE 2015 Project Team we need to know what kind of leadership style that will be effective to the team along the process. For the start, our Mentor gave the assignment to assess the team development stage using Tuckman Model, introduced by a psychologist, Prof. Bruce Tuckman in 1965. From there we can analyze what leadership style can be effectively implemented. Tuckman’s model explains the evolution of each member, forming interaction that will initiate some frictions in storming stage and later build the agreement after sometimes (norming stage). Final stage of this process will be performing, when each individual reach the same vision and perform collaboration together for group goals. The only work to do by project member is filling 32 questions developed by Donald Clark. The answers then collected which will lead to score system with their relevant stages status. Indeed, group answers could be different than single personnel opinion and could be bias from the true condition. That’s why for Delphi Technique the P70 taken as start level because it’s not sure in the beginning everybody ready to collaborate serves in short period of first face to face session. It shown on the Table 2 that currently Garuda AACE 2015 Project Team is in the Performing Stage (shown by higher score, Rank No. 1). The small variance shown in Table 2 shows that the survey result is quite represent all the team members opinion that currently they are in the Performing Stage. The 5 days intensive course followed by group work and lesson learned from some team members who repeat the course may contribute to the team dynamic so they can arrive at the Performing Stage. As the team development stage currently is in Performing Stage, we need to adapt leadership styles that effective in this stage. 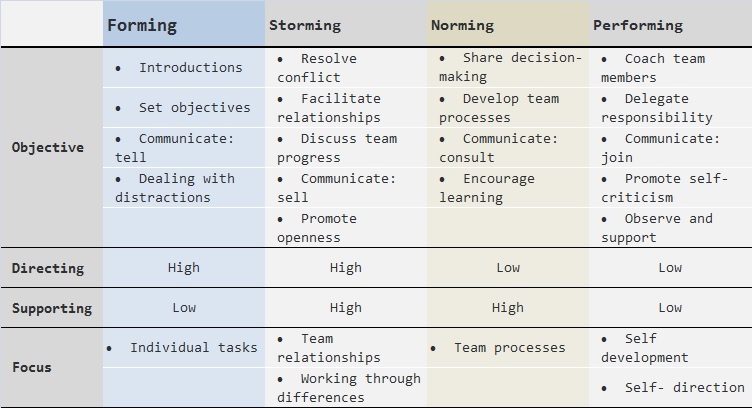 The following table summarizes style and objective for each stage of team development. In the Performing Stage, the effective leadership is more in the observing and supporting style while focus in self development and self-direction. Tuckman tool together with leadership style adaption are useful for the Program Manager to establish strategy leading the team. Further monitoring on the team development stage should be planned so the leadership style and the team development stage always in line. CSCAWEB.org. (2012). Survey: what stage is Your Team In?. Retrieved from http://www.cscaweb.org/EMS/sector_team/support_files/tools_for_the_team/tool_stage.pdf. Project-management-skills.com. (2012). Teamwork Theory: Stages of Group Development. Retrieved from http://www.project-management-skills.com/teamwork-theory.html. What I suggest is sometime around W10 or W12, come back and do this again just to see if you were correct or not……..